The main difference between the two models is the timing rotor. 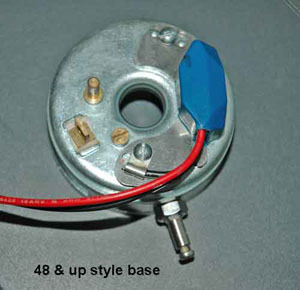 Timing differs since Harley changed the ignition base plate breaker points position relative to the front cylinder. The Electronic part (baseplate with blue moulding) will fit both situations. One has to check what model ignition timing base is fitted on the bike. Some bikes have a wrong model ignition system mounted in respect to the year. This can be very confusing. Especially in the year 1947 where the timing base changed. The ingnition module replaces the Condenser and Breaker Points. It is designed to work on 6Volt and 12Volt battery powered systems.